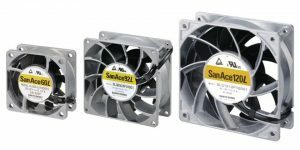 Sanyo Denki’s ultra-long life, high reliability rugged AC and DC fans and blowers are currently available for immediate shipment globally from Digi-Key Electronics, a global electronic components distributor. Sanyo Denki produces fans with a high temperature range, long life, and environmental protection options, which dramatically increase the overall application life of many products and designs. The fans and blowers are ideal for many applications including automation, server cabinets, telecom, medical, the food industry, and anywhere air needs to be moved. For more information about Sanyo Denki and to see their entire product listing, please visit their Supplier Center page on the Digi-Key website.